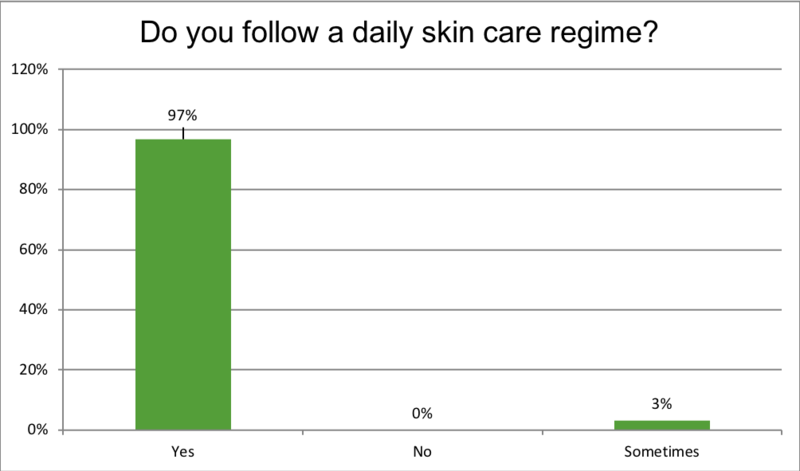 Home Surveys Survey Results - Do you follow a skin care regime? Results - Do you follow a skin care regime? 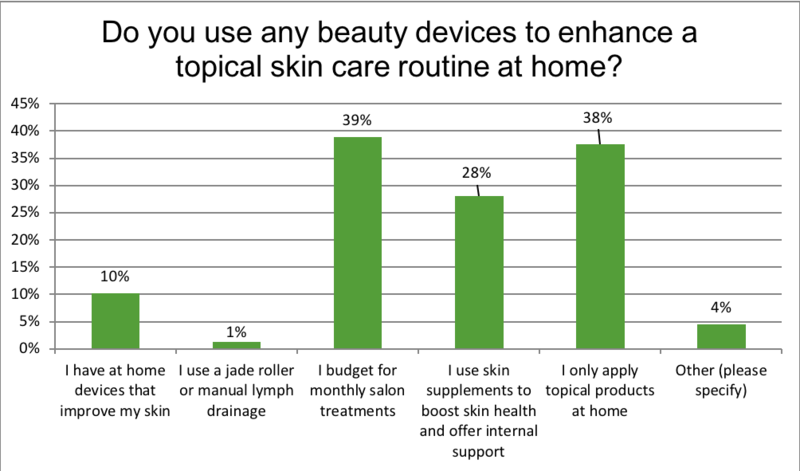 Our September survey asked questions about your skin care regime! Do you follow the same routine morning and evening? Which products do you use? What SPF do you incorporate in your daily product application? Read more and see the graphs below for further information! 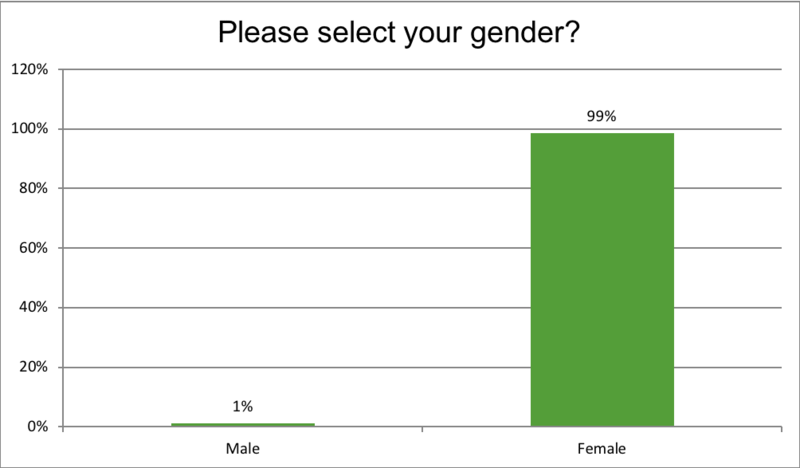 We had a record respondents completing the survey during September, 157 individuals, of which 99% were female, and the majority of respondents spread equally between age groups 26 – 65. 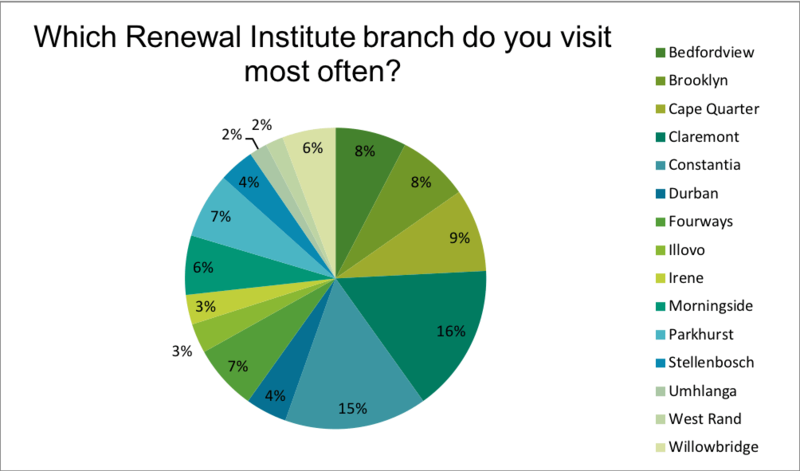 It is fantastic to learn that 97% of respondents follow a daily skin are regime: at home skin care maintenance is vital to ensure your skin enjoys the cleanliness, nourishment and exfoliation to support in-clinic treatments for prolonged benefits. 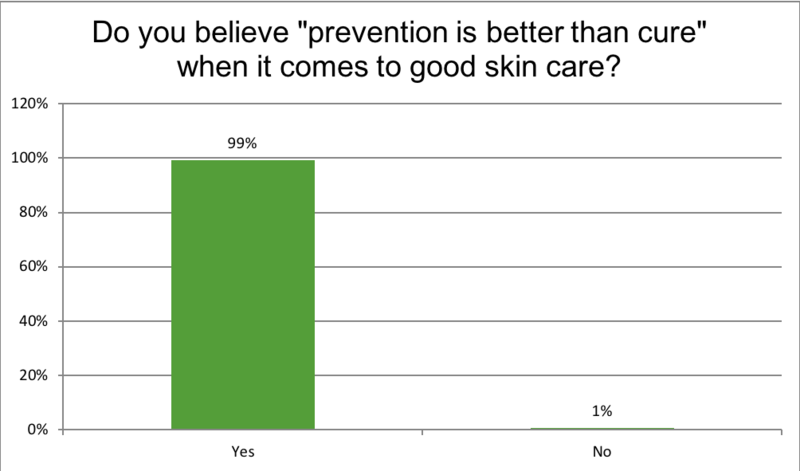 In addition, almost ALL respondents believe that “prevention is better than cure” when is comes to good skin care. This is so true – looking after your skin from a young age will not only prevent quicker deterioration, but prolong a youthful and healthy appearance of skin vitality! The majority of patient use a daily cleanser and SPF, which are important to ensure your skin is cleansed properly from daily environmental pollutants, and most importantly protected from the harmful sun! 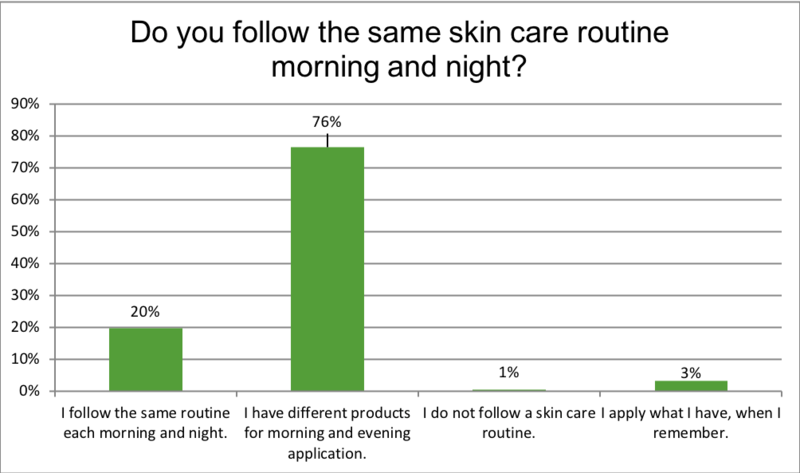 76% of respondents follow a different skin care routine in the morning and night, which indicates specific products are applied as and when needed. 41% of respondents use a dedicated make-up remover, and 20% only when needed. A dedicated make-up remover is not always needed, as many cleansers will thoroughly remove make-up debris, it is just important that you do ensure all daily make-up is thoroughly removed including foundation, and any eye make-up, without scrubbing or pulling the skin too much, as this can contribute to accelerated ageing of the skin. 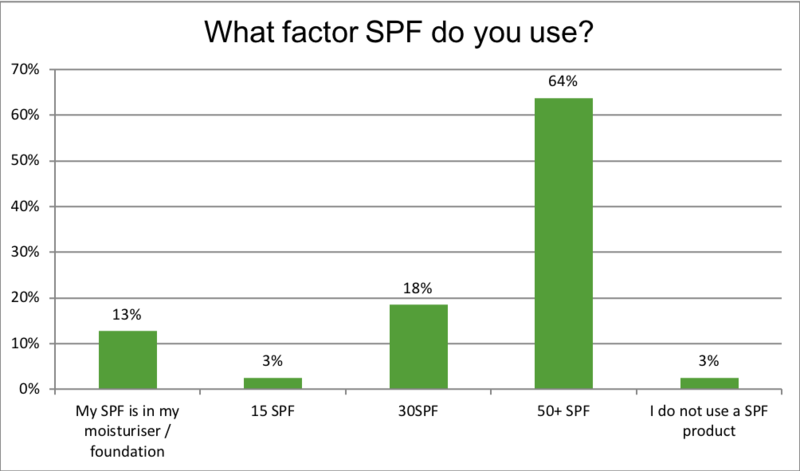 64% of respondents use a dedicated SPF product of 50+. This is fantastic, but be sure you check the ingredients to ensure the chemical component of the SPF is not harmful or will cause irritation to the skin. Only 3% of respondents do not use an SPF, and we urge these individuals to invest in a good quality SPF product – especially during the summer months (though SPF should be applied every single day). Shop Online to view the various products we have available! 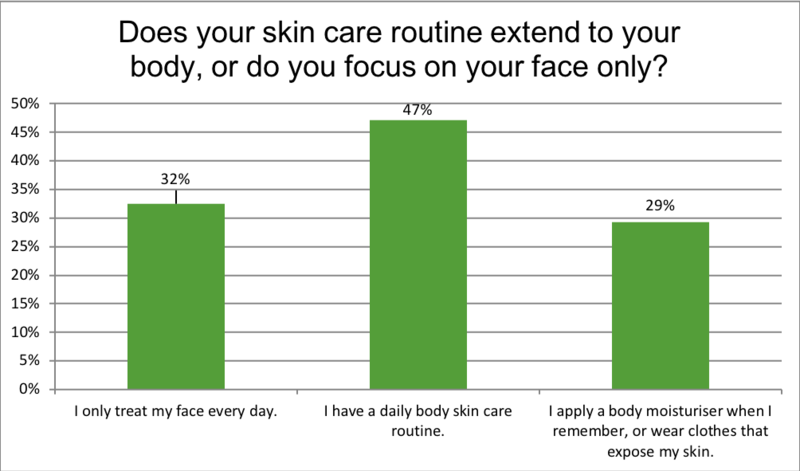 It is good to note that 47% of respondents have a dedicated body skin care regime too. Though the skin on the body is tougher than the face, keeping your skin well exfoliated, moisturised and protected against the sun is vital! 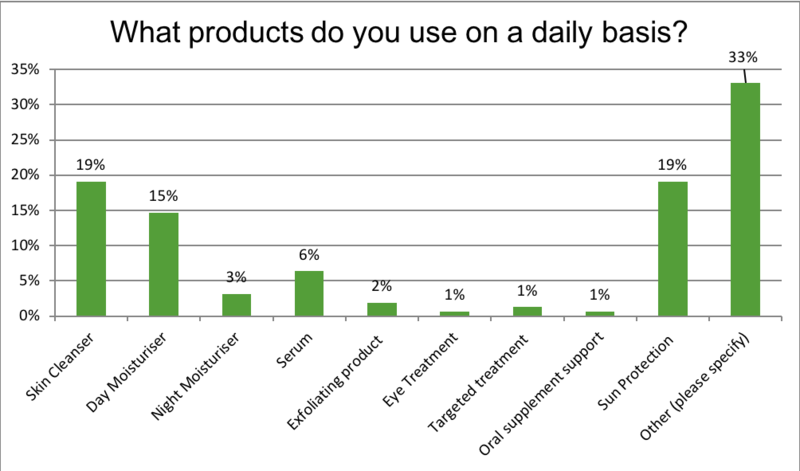 28% use skin supplements to support topical and in-salon treatments.